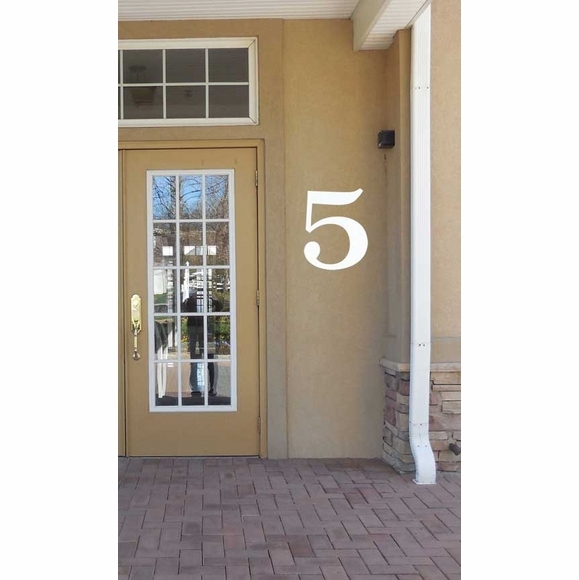 Jumbo Reflective Address Numbers 20" for Businesses, Professional Offices, and Homes - - . Custom made in the USA. The numbers are made from 1/16" (.0625) acrylic which means they are very thin and lack depth since their main purpose is to be reflective. If you are interested in thicker numbers, please do not order this product. Highly reflective signage makes a major difference in nighttime visibility. Reflective numbers allow fast and easy address identification for emergency 911 vehicles, deliveries, and visitors. Because these numbers are white in color, they must be placed on a dark contrasting background to be readily visible during the daytime. At night, however, they are highly reflective no matter the background. The large image shows a reflective number mounted on a contrasting background during the day. The small image shows a reflective number in darkness illuminated by a flashlight next to a standard non-reflective sign. Withstands temperatures to 170 degrees F without deflection. Numbers can be arranged vertically, horizontally, diagonally, or however you desire. Made from sturdy and UV-stabilized. non rusting acrylic 1/16" thick. Comes with 3/16" diameter fastener holes and stainless steel mounting screws. The number of holes varies from two to five depending on the number. Dimensions (approximate): the number 1 is 20"H x 7.25"W. All other numbers are 20"H x 12.5"W.
Custom order made especially for you. Comfort House exclusive 911 number signage allow fast and easy address identification for police, ambulance, fire, and other emergency 911 vehicles; deliveries; and visitors.